-And a chance to win a weekend at the lake this fall in a cabin that sleeps up to 14. Besides receiving all of this, you can find your dream home! The Village at Reflection Lake Nantahala is a new exclusive lake and mountain view community. Home sites start from just $94,900. Standard cabins feature 3,023 square feet of space with three bedrooms, three-and-a-half baths, a loft, gourmet kitchen, great room with wood or gas burning fireplace and a huge master bedroom. Community amenities include a gated entrance, protective covenants, underground utilities, a shared pavilion, walking trails and lush green space. Plus, enjoy all of the recreational activities that the lake brings. Reflection is a tranquil retreat that is easily accessible from Charlotte and Greenville. 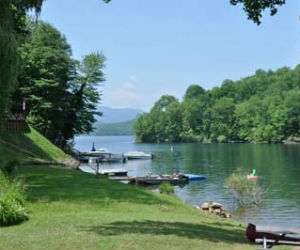 For more details or to schedule a day at the lake before the promotion ends, call 866-218-8439 or visit www.lakenantahalareflection.com/thevillage. This entry was posted in Events, Homebuyer Incentives, North Carolina and tagged Lake living, New homes in North Carolina, The Village at Reflection Lake Nantahala on September 7, 2011 by Carol Morgan.